The pecan tree can grow to enormous heights, sometimes to heights of 180 feet, and has an upright growing pattern. The bark is pale gray or whitish brown, scaly, and deeply furrowed. The bark on the pecan tree is rough and scaly, and is pale grey or brown. The heartwood is solid brown and black. pollinate. The pecan nut is long and pointed with a thin shell. The pecan tree grows in North America. The tree is found in deciduous forests. Most pecan trees like humid climates. The tree is a member of the walnut family. The Pecan tree is the State tree of Texas. Pecan nuts were a major food source to the Native Americans. They would eat these nuts, and store them to survive through the winter. The tree is used for its wood to make furniture like cabinets, benches, stools, chairs, and other useful supplies. The pecan industry produces 250,000,000 lbs. of pecans a year. Farmers harvest the nuts that have fallen off the tree. The nuts are not directly picked off the tree, because only the nuts on the ground are edible, and the ones on the trees are still growing. The nuts are put in boxes, and sold in stores and marketplaces. 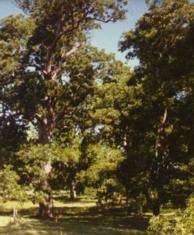 The pecan tree is not on an endangered tree list because there are so many of them still growing.